Cleveland-Cliffs (NYSE: CLF) released its Q4 2017 earnings results and conducted a conference call with analysts on January 25. As previously anticipated, a reduction in pellets nomination by a long time customer led to a fall in shipment volume from the company’s U.S. operations and an unfavorable business environment in the east, led to a fall in revenue from the company’s Asia Pacific (APAC) operations. 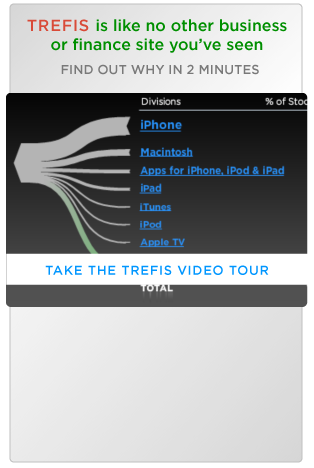 These factors resulted in Cliffs missing its revenue estimates for Q4. 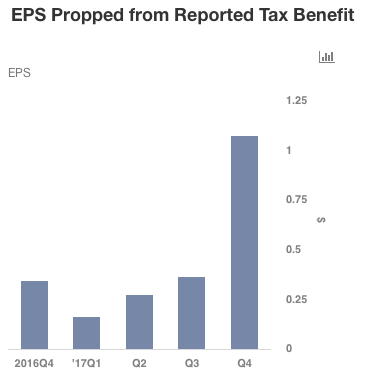 However, an additional tax benefit as a consequent impact of the latest tax reform propped earnings and enabled Cliffs’ to beat its earnings estimates. The major takeaways from the announcement have been illustrated in the graphs below using our new interactive platform. 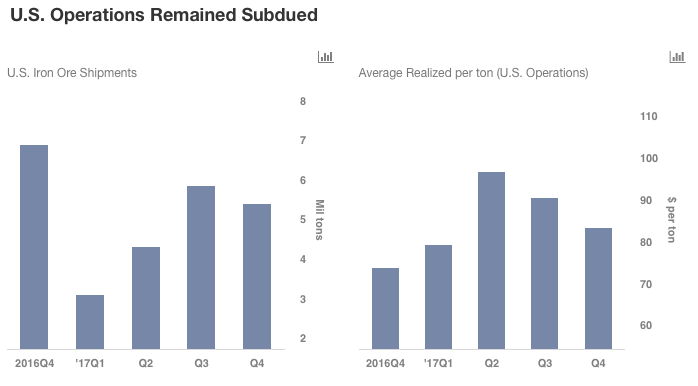 The company’s U.S. iron ore shipment volume was significantly hurt due to a material reduction in pallet nomination by their long-term contract customer. Additionally, iron ore prices remained weak, although displayed an improvement on a year-on-year (Y-o-Y) basis. Cliffs’ APAC operations in Q4 ended in the red for the first time in 2017, largely due to a change in preference of Chinese steel producers for high-grade iron ore as this is less pollutant to the environment. Cliffs’ access to lower grade iron ore in the seaborne iron ore market remained a major setback this year. The company subsequently plans to discontinue its APAC operations by 2018 if it continues to remain unprofitable in the upcoming quarters. However, despite the above mentioned detrimental factors which negatively impacted the company’s top line, the company’s bottom line was significantly lifted by a reported tax benefit of $246 million as a consequent impact of the Tax Cuts and Job Act of 2017. The tax benefit was recorded as a reversal of the evaluation allowance for Alternative Minimum Tax (AMT) credits, the cash benefit of which will be realized over a span of the next 4 years. Additionally, with the latest tax reform, the company is expected to be tax-free for the foreseeable future as a result of the withdrawal on the limit of the deductibility of historical net operating loss carryforwards. Cliff’s is estimated to increase its sales volume to 20 million tons in 2018, a 7% increase from reported 2017 volumes. This increase would be a resultant impact of the recent acquisition of the 100% stake in the company’s Tilden mines. Increased sales volume would remain advantageous for Cliffs in the upcoming year given a favorable action is taken by Pres. Trump regarding the pending decision of the section 232 probe. We have $6.23 price estimate for Cleveland-Cliffs which is below the market price.